There’s a good chance things could get really out of hand this weekend. So just to be prudent, let’s take this moment to discuss your bucket list. And how you can cross off “get a tattoo” and “cameo on a reality show” in one fell swoop. Fade in on Wooster St. Social Club, a 4,600-square-foot vintage tattoo parlor/television set that’s equipped to turn your next inking into a three-part Nielsen-ratings bonanza, accepting appointments now. Say you’re looking to permanently commemorate your appreciation for Mom while at the same time making a smooth transition from moonlighting in Oscar-winning dramas to stealing scenes on premium cable. 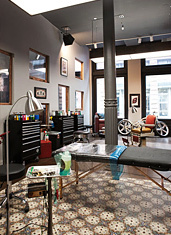 So you’ll make an appointment at this SoHo-based tattoo shop (undoubtedly the first of its kind with a padded boxing ring), where inside you’ll find authentic 1940s machinist tables, antique window fixtures from the Flatiron Building and an on-call camera crew filming TLC’s NY Ink. Because if there’s one thing a regrettable 4am butterfly tattoo needs, it’s a national audience. Assuming you sign the waiver (and the producers okay your creative decision to wear an ascot), it’s almost a foregone conclusion that you’ll wind up on the show in some capacity. And between the private confessional room and that boxing ring in the back, you’ll have plenty of opportunities to really show your range as an actor. It’s like Shakespeare in the Park, but with more tribal face tattoos.